Mario Batali uses his super-foodie E.S.P. to give us a heads up about our edible future. 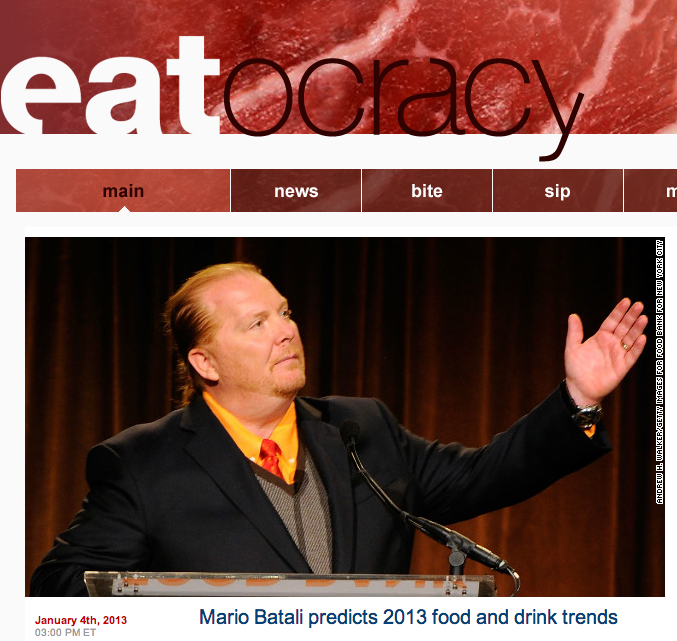 Kate Krader, Food & Wine’s restaurant editor summed up Batali’s food trend predictions for 2013 on the CNN Eatocracy blog and we are thrilled that there is a place for the hand-made in his gastronomic crystal ball. To be exact, Krader reports Batali is predicting a trend in: “Hand-made food in all forms. Skip all the processed foods in favor of non-processed tortillas, cakes, pasta, jams, breads, sausages and salumi”. For Gustiamo, hand-made is already pretty darn trendy. There is a food artisan’s hand in every product that we import from Italy to the USA. Just to name of few, our food makers hand-harvest crocus stamens (saffron, if you don’t know), handpick Frantoio olives to press with a traditional granite millstone, hand wash and peel oranges for marmalades, hand-cure anchovies with sea salt harvested by hand, and handpick Real San Marzano Tomatoes. Let’s hear it for a hand-made 2013!